As you may or may not know about me, Charlotte Bronte is my favorite author. The Bronte sisters and their story have interested me for quite a long time now, and one year while visiting the Yorkshire Dales, we had the chance to visit Haworth and the Bronte home. What a place! It was on a rather dull wet day, too, which made it all the more special for me as I knew it was tough living back then for those women in that small Yorkshire town. At the moment, I am just finishing up a book that I am finding it hard to put down, “The Secret Diaries of Charlotte Bronte” by Syrie James. It’s in the form of a novel but most of the events are taken from records of the Brontes over the years. My only regrets during that visit were 1) that I’d left my camera at home and got no photographs, and, 2) we didn’t seek out the area in the moors that was the inspiration for “Wuthering Heights,” the novel written by Emily Bronte that you probably have read or seen in movie form. 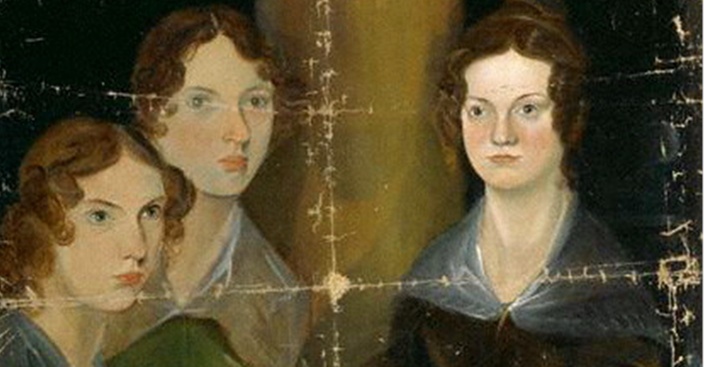 Click here for a movie version of Jane Eyre and Wuthering Heights. There have been speculations about how and why the sisters and their brother Branwell all passed away at such young ages, and I’ve read theories that they were murdered! Their father, Rev. Patrick Bronte, outlived all his children, for some reason. He was not in ideal health himself, but there you go. I wish there were more concrete records about the time periods surrounding the deaths of the three sisters. Anne Bronte is buried over at the east coast of Yorkshire in Scarborough where she had gone to “get the sea air” during her last illness. Anne Bronte is buried here in the church yard in Scarborough, overlooking the sea – which also serves as a car park when needed. The Bronte sisters and brother Branwell all seem to have died from what they called “consumption” back then. It is thought it had more to do with the harsh weather and lack of hygienic conditions in the small towns back in the early 1800’s in England. If only Charlotte had lived longer. She had just been married and was expecting a child when she passed away. I’m not sure we would ever have had another novel that could out-match her “Jane Eyre,” which is my favorite book. The sisters wrote in these tiny homemade books because paper was very precious and rare for them then. So I hope you can find some things in this web site to enjoy for yourselves. 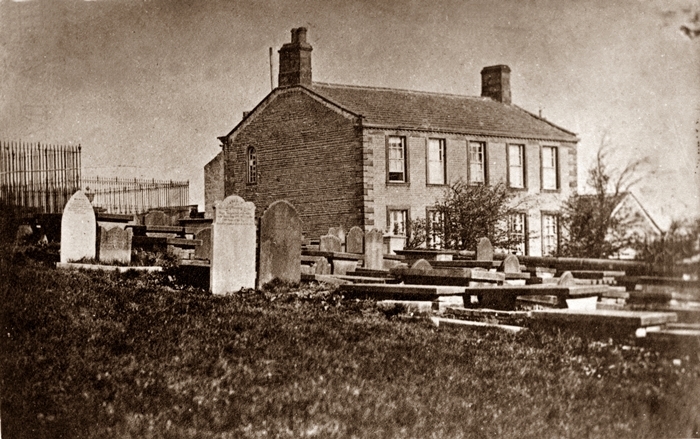 Click the photo of the Parsonage below for another interesting web site concerning the Bronte story. I read this book, “The Crimes of Charlotte Bronte” a few years ago just for the heck of it. I know it’s only speculation on the part of the author but I like to hear all sides to things. I thought it was well done and quite plausible. The fact that all 4 siblings died so young and all withing a couple of years or so of each other always bothered me, and the theories put forth in this book seem to make more sense than not. 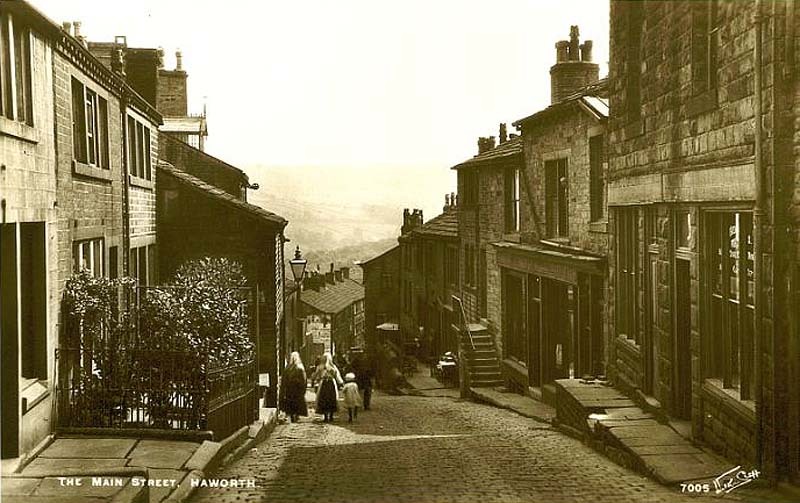 I’ve been to Haworth – it’s very moving. I loved that their father’s name is still on the list of vicars who have served in he church, just sitting there quietly, like the rest of them. I seem to remember the graveyard being very full and something about many of the villagers dying within a few years, but nothing about any suspicions. The house was very small – that surprised me too. WOW! Fascinating. I plan to read more about the family now that you’ve brought it to my attention. Another good Sunday Special. I love “Jane Eyre” and “Wuthering Heights” when I read them. It has been ages but they were suggested by my maternal great aunt who had been an English teacher and she made sure I read all the great novels which I’m glad she did. BTW, I love your top photo of your deck. It looks so peaceful. Enjoyed your post so much! I particularly like the painting of the three sisters, no simpering coyness, no arrogance, down to earth, brave… women at their best. I have had Jane Eyre on my reading list for so long. Maybe this is the year! Thanks for putting all this together. “WOW”…Love to read anything about them and you have gave us so much…THANK YOU .